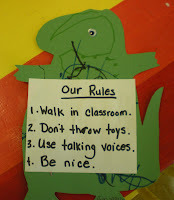 Since this is the first experience for some of the little ones in a classroom, many are unaware of some important proper "etiquette" habits for the room. Years ago I came across a little story in my McMillan activities pack that has always been very helpful with this concept. 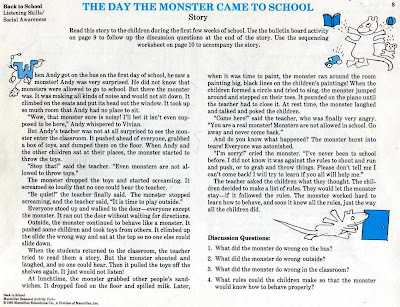 We read together the story, "The Day The Monster Came to School." I'm not sure if I'm reading this with too much feeling or what, but everytime the Monster cries in this story, some of the children's eyes well up. I think it's a cute story that they can relate easily to. During the story we discuss things that the Monster is doing that might not be good things to do. Then we try to figure out ways that he might have done something that would be better. 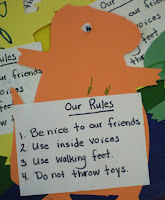 After we read the story I have the children come up with a list of rules for our class. We always have; don't throw toys, because it's the first real thing the Monster does that they know isn't good. All the other rules I try to put in a positive way. I write the rules on the board. 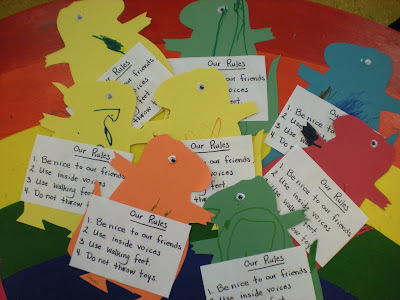 Then for our craft we make a little monster with the rules on him and I send a note home to Mom and Dad explaining exactly what the craft is and how we came up with it. Also, asking that they reinforce these concepts at home. 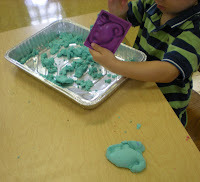 It is a very easy craft and goes quickly, but it takes a while for some of them to get the hang of that glue stick. For the craft I just cut out a monster shape similar to the one in the story. I let the children color the monster with markers. We add a googly eye and glue the rules on his "belly." 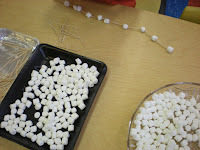 Today we also did marshmallow sculptures. The AM class was very reserved in this area. I only had a few that even tried the activity. The PM class on the other hand was totally opposite. 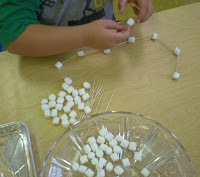 They enjoyed making many different things--along with filling their bellies. 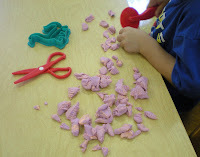 I also had the Play Doh out with scissors and pizza cutting wheels. This was fun for all. Our final table was a bit messy with Moon Sand. One of my children had gotten this for a gift, but only used two of the four, so I took it to school. I think the bottom of my shoes are 10 different colors with all the Moon Sand I stepped in. This was an area some of them again were a bit hesitant because they weren't sure what it was or what they should do with it. After I sat with them a while and just played and molded, there was a much bigger response. Our great day ended with a trip to the playground. It is so great when we can get outside. It was bit cloudy and we weren't sure if rain was going to come, but we didn't make it out last week and I said as long as there was no rain we were going! Omgosh that would be funny to see you reading that and the kids crying! You should have been an actress! Nah, you're too good of a teacher! There are some great ideas here. Thanks for sharing! The monster rules are so cute! 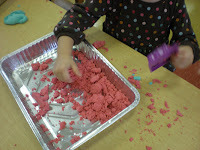 My girls love moonsand and boy it can be messy. 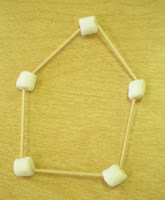 They also love to be little architects with the marshmallows, but end up eating too many! The girls are off school tomorrow, so I bought little wooden figures for them to paint for Halloween. 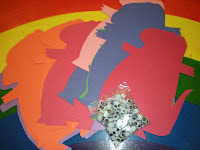 Thinking about trying to make necklaces with candycorn- wonder if they will break when I put the needle through. Missing my girlies today. So quiet around here. Glad to be able to see them tomorrow. Wow looked like they had lots of fun!!! Heck I would have had fun! your blog is really useful. thank you. i'll read the story tomorrow and i'm hoping it helps some of my preschool children accomodate a new student who doesn't yet know the rules. thank you so much.